Do you often wake up on the wrong side of the bed? With a majority of our lives spent tucked in, it’s no wonder that poor sleep quality can have a negative effect on day to day life. At the end of a long day, you deserve to slip into a bed that offers a restorative nights rest, instead of waking up in a bed that leaves you feeling sore, cranky, or fatigued. 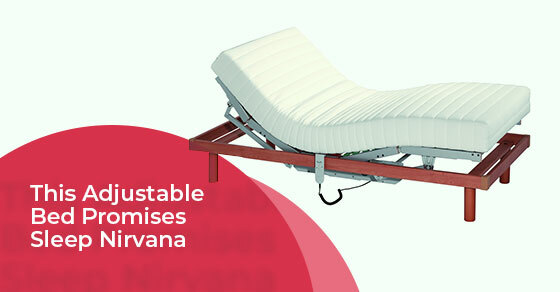 Fortunately, the Sealy Reflexion Tuxedo Adjustable Base can offer you this luxurious sleep experience. The Sealy Reflexion Tuxedo Adjustable Base allows you to pre-program your perfect night’s sleep. Experience the cloud-like comfort of three preset rest positions, while the built-in massage therapy eases your aches and pains with three levels of intensity. The three preset rest positions available for the Sealy Reflexion Tuxedo Adjustable Base includes Zero-gravity mode, which works to eliminate bodily pain by raising your head and legs. The Lounge mode, which raises your head and lowers your feet, and is perfect for in-bed activities, such as watching a movie or reading a book. Finally, the Incline mode allows you to sleep on a slight incline to optimize relaxation. Additional ways the Sealy Reflexion Tuxedo Adjustable Base allows you to program your perfect sleep is by controlling an unlimited number of ergonomic position to adjust the position of your head and feet, while switching between full-body massage mode and three different massage wave intensities. For the many custom sleep options this adjustable bed offers, the most important thing to consider when choosing a mattress to fit this base is flexibility and durability. So, while a spring-loaded mattress may be out of the question, the best part of the Sealy Reflexion Tuxedo Adjustable Base is that you don’t necessarily have to get rid of your favourite mattress to enjoy a perfect sleep. This versatile bed can accommodate your pre-existing memory foam or latex mattress as long as you keep in mind that the thickness and firmness of your mattress may reduce the intensity of massage features and, due to constant movement, may wear down quicker than anticipated. For best results, it is recommended that this base is matched with any Sealy, Sealy Posturepedic, or Optimum mattress. The Zero-gravity feature of the Sealy Reflection Tuxedo Adjustable Base is designed to deliver anyone experiencing any back, hip, or joint pain into a restful slumber. While regular beds are designed to cushion our bodies while we sleep, the result is not necessarily the contoured, cloud-like, experience you were expecting. Instead, a stationary mattress can place unwanted pressure on already sensitive areas. The benefit of a Zero-gravity bed is that it minimizes the amount of pressure put on your body by allowing you to adjust the bed to a position where there is less gravity applied. Although this bed can’t really defy gravity, the idea is that less gravity means less pressure, and surely, a better rest. How many times have you had to get out of bed to check your phone that is plugged into the wall across your bedroom or get tangled in the cord of your handheld back massager? Wireless is the way of the future and, lucky for you, the Sealy Reflexion Tuxedo Adjustable Base offers it today. The Sealy Reflexion Tuxedo Adjustable Base features a wireless remote control that gives you access to all elements from the comfort of bed. Among other options, the remote includes a ‘Zero-gravity’ button that will raise your legs, while the six-level massage option allows you to set a timer of 10, 20, and 30 minutes and will click off even if you have fallen asleep. For tech-savvy users, perhaps the best part of the Sealy Reflection Tuxedo Adjustable Base is that it can be controlled with Bluetooth through an application downloaded to any smart-phone, while two USB ports installed in the base allows you to power mobile devices. If you ever find yourself struggling to get comfortable on your old, tired bed, then look no further than the Sealy Reflexion Tuxedo Adjustable Base. With the Sealy Reflexion Tuxedo Adjustable Base, sleep Nirvana is just one gravity defying, wireless, click away. So what are you waiting for, get that heavenly sleep today! For help with choosing your next mattress, call Mattressville at (905) 212-7722 or contact us here.